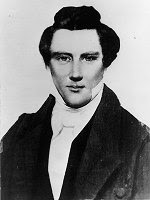 Kim Marshall (who blogs here) seems to have inherited a photograph of LDS Church founder Joseph Smith, Jr. Only one photographic image of Smith is known to exist—the original being a daguerreotype dating from the early 1840s. Marshall believes her photo is from the same glass negative used to create the Library of Congress print. But, unlike the one owned by the Library of Congress, hers was never retouched. Photo-historian Al Thelin established that Marshall's print was produced from "a negative of substantial quality," which has yet to be found.